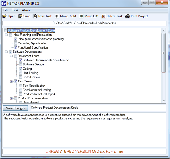 IP Wedding Planner is a personal wedding planner for windows. Use it to record your wedding suppliers, tasks and costs. Monitor your progress with quick reports. . .
Calendar and Day Planner will help you manage appointments, to-do lists, schedules, and more. Make appointments and set up alarms to remind you of upcoming events, meetings, parties, vacations, birthdays, anniversaries, etc. Weekly Planner will help you to work smarter, increase your productivity and reduce confusion in your life. A simple list of things you need to get done on a specific day will keep you focused. Includes Diet & Health Planner, Money Tracker. Effective Office Planner allows you to keep your plans under control. Working details have to be available quickly and this can help. Types of details that can be saved include, working time, appointments, training, costs, etc. 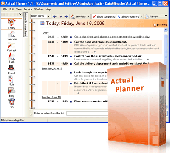 Effective Office Planner allows you to keep your plans under control. Working details have to be available quickly and this can help. Types of details that can be saved include, working time, appointments, training, costs, etc. Phone, email and website addresses can also be saved. Effective Study Planner can help you save your own studying details. If you are a teacher of a student, then this can be used for you. Level of study, teacher, students, duration, location plus many more can be saved. The subject such as math, English, painting, health, etc. can be saved. Daily Planner Journal is a capable, multi-module organizer.. It includes a daily Planner, small daily journal and a to-do list. Various print options and more. Now enter recurring appointments and import from To Do List function. Calendar function allows import of appointments from Daily Planner function and To Do Items from the To Do List function.